The second floor accommodates different spaces of various sizes. 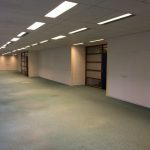 You can adapt the layout of the office areas to suit your requirements. More information? Contact us to make a viewing appointment, no strings attached.